6 Ports for use with Keystone style inserts, modules and jacks. Perfect for Home and Office use in LAN, Data, Telephone, Satellite TV, Cable TV (CATV), Closed Circuit Television (CCTV), Satellite, Home High Speed Internet, HDTV, Automation Applications, Video Distribution and Power Limited Circuit Cable for General Purpose Applications. Made of High Impact ABS Plastic, UL Approved, Standard Size of 2 3/4 by 4 1/2 inches available in White or Ivory. Screws Included. Note: Keystone Wall Plates allow you to customize your Wall Plate configurations using Snap-In Inserts with various couplers, connectors and jacks necessary for interconnection to your Distribution Network. 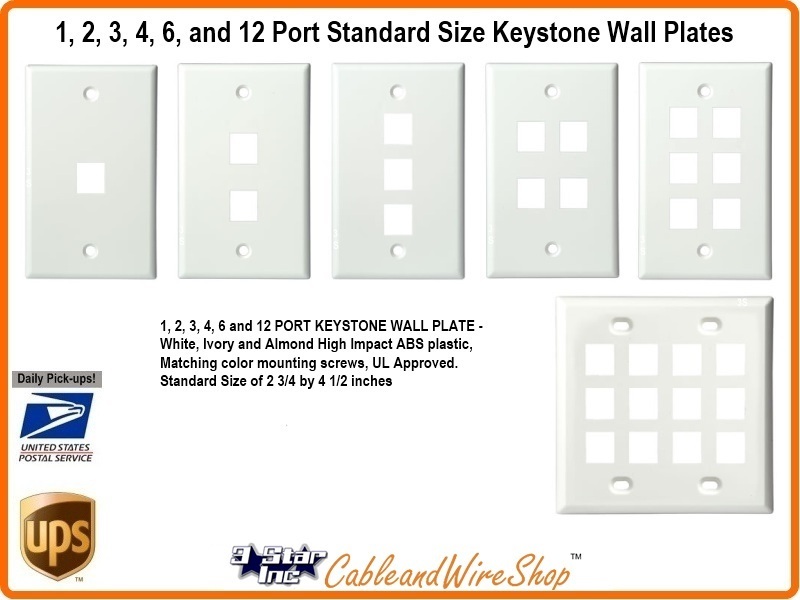 Keystone Wall Plates are typically made of high-impact ABS and fire retardant plastic, fit standard NEMA openings and come in 1, 2, 3, 4, 6, and 12 port configurations as well as colors that match the Leviton color patterns and include color matched screws. A Keystone module is an industry standard type of wall jack used in residential and business environments. The system consists of a modular face plate to which jacks are mounted. Flush mount Keystone Wallplates will fulfill the most complicated station installation requirements through a wide selection of snap-in modules. A variety of jacks and connectors will fill the wall plate openings to meet your specific requirements of voice, data, audio, video, fiber optic, etc. The inserts are a snap to install and remove, giving you a highly adaptable system. A keystone jack module is a standardized snap-in package for mounting a variety of low-voltage electrical jacks such as TV, Phone, LAN, Data, BNC, RCA or optical connectors into a keystone wall plate, surface-mount box, or a patch panel. Keystone modules have a commonly popular standardized rectangular face of 14.5mm wide by 16.0mm high and are held in place with a flexible tab. This allows them to be snapped into or out of a mounting plate with correspondingly-sized rectangular holes, called ports. All keystones, regardless of the type of jack they carry, are interchangeable and replaceable. This is what makes Keystone a popular choice in today's installations at Home or Office. Some keystones use a pass-though type connector, where there is a jack on both the front face as well as the rear side. Others only have a jack on the front and employ a different means for hard-wiring signal cables in the rear, such as a mini 110, insulation-displacement connector, crimp or solder connection.